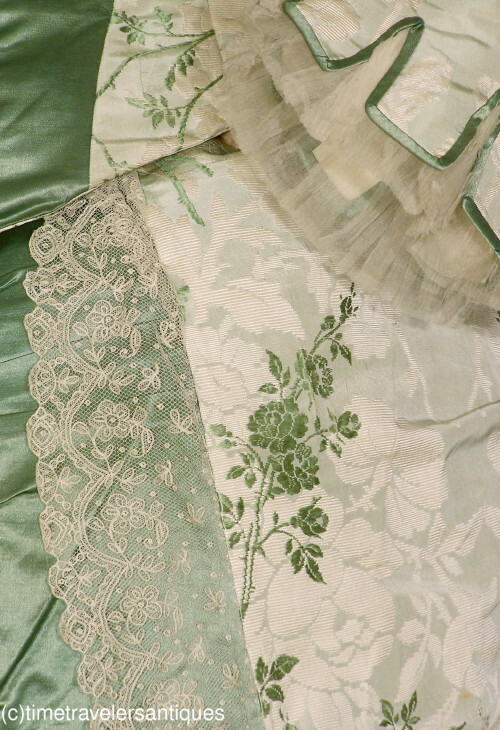 A magical original circa 1880 lady's elaborate sage green floral silk brocade two piece bustle gown with fern green accents and moss green silk satin panels. A unique crisscross silk cord laced design to the decolletage with tab accents that repeat at the cuffs having pleated silk chiffon inserts. The lined bodice has deep points to the hem and decorative floral metal buttons to the front closure. The fashionably slender lined skirt has a ruched and pleated front panel, and a draped bustled back to the attached over skirt that is trimmed in blonde Chantilly lace. The skirt has a deep pleated hem and a back of waistband closure with no fastener. 13" from shoulder to shoulder, a 33" bust, 23" waist, and 54" from shoulder to front hem. In very good clean sound as found condition, with minor perspiration to the armscyes, some minor scuffs to the satin along with a few very light 1/4" spots to the front skirt panel, and a few scattered small age flaws and holes in the lace and the chiffon cuffs. Recently deaccessioned from a Southern museum collection with a 1970 accession numbered tag attached. 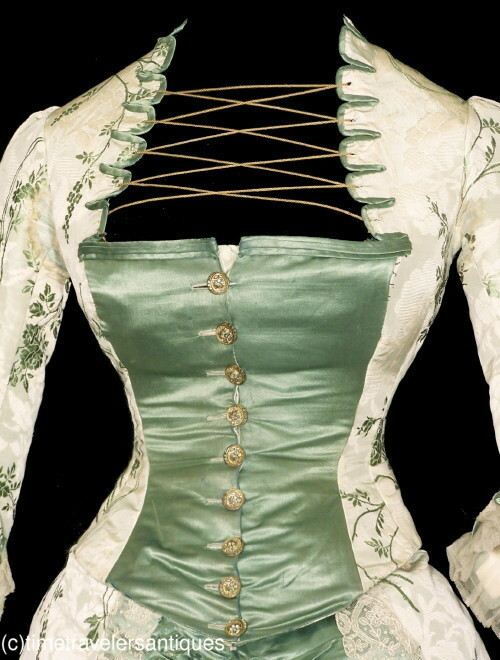 A stunning Victorian era bustle gown. I would totally wear this on Saint Patty's day. Drool, drool! I so want to recreate this one!